Max Cavalera is probably the hardest working guy in metal these days. Just this year, the former leader of Sepultura toured with his band, Soulfly, in support of their latest album Savages; released another absolutely stellar self-titled album with his supergroup, Killer Be Killed; published his autobiography, My Bloody Roots: From Sepultura to Soulfly and Beyond, and did a book tour to promote it; and, somehow, found the time to jam with Suicide Silence on the Sepultura classic “Roots” at this year’s Revolver Golden Gods Awards (video is here below!). Now comes the announcement, through Blabbermouth, that one of Cavalera’s other bands, Cavalera Conspiracy, will be releasing their third album in October. 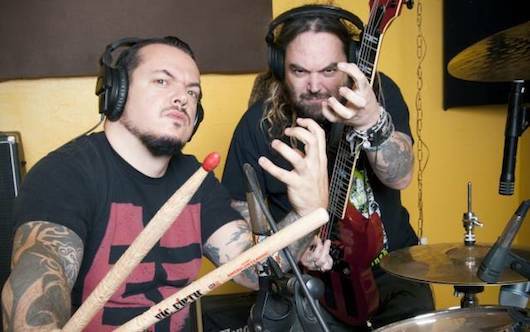 The group reunites Max and his brother, Igor Cavalera. Both brothers were founding members of the ground-breaking Brazilian metal juggernaut, Sepultura. When Max left the band acrimoniously in 1997, Igor stayed behind as their drummer. This caused strained relations between the two until Igor also left Sepultura in 2007. Their reconciliation lead to the formation of Cavalera Conspiracy, which has produced two albums that mirror the brutality of their early work with Sepultura.